Artificial intelligence (AI) and machine learning took centre stage at IBM Think this year, as the show’s major AI announcements served as a reminder that IBM has some of the most differentiated and competitive services for implementing AI in enterprise operational processes. But if Big Blue is to win the AI race against Amazon, Microsoft and Google in 2019 and beyond, it must improve its developer strategy and strengthen its communications, especially in areas where it leads the market, such as in trusted AI and governance. Let’s dig a little deeper into IBM’s AI strategy, the leading announcements from the Think event and what they mean for the market. IBM CEO Ginni Rometty kicked off the Think event with an emphasis on how companies are entering “chapter two” of cloud adoption and digital transformation. This next phase is defined by firms scaling up their digital projects, making use of data on a mixture of traditional IT systems and public and private clouds, and putting AI at the centre of their business processes. Ms Rometty took the opportunity to shed some light on IBM’s next chapter as well, following its $34 billion acquisition of Red Hat in 2018. Although the acquisition is pending regulatory approval and not expected to close until the second half of 2019, Red Hat has breathed new life into IBM and its strategy, which is now focussed on hybrid, multicloud services. IBM claimed that 94% of enterprises are using a combination of public and private cloud environments today, and two-thirds are using more than one public cloud provider. Many large firms remain fearful of lock-in by the hyperscale cloud providers and are rightly concerned about their ability to move data between clouds, and about applying connectivity, management and security among them consistently. IBM’s strategy, which was evident throughout Ms Rometty’s keynote, is to address these concerns by offering a pick-and-mix set of services formed from its middleware heritage that help customers manage workloads spanning these environments. They are based on open-source technologies such as Kubernetes containers and OpenShift, Red Hat’s container application platform. Ms Rometty stated that Watson engagements now total 20,000 — a 25% increase from 16,000 in 2018 — spanning 20 industries and 80 countries. However, despite this adoption, the market remains highly experimental, with many customers still carrying out proofs of concept or implementing narrow point solutions and preferring to start small. Although we predict that by the end of 2020, 90% of large enterprises will be running pilot or production-level machine learning applications, very few will have fully implemented the technology within business processes or have a comprehensive AI strategy. This is because of poor quality of data, a lack of skills, and concerns about trust in the technology. IBM’s strategy and portfolio focuses on these core challenges and prioritizes its range of big data and analytical tools, and the plumbing of AI, reflected in Ms Rometty’s keynote slogan “there is no AI without IA” (information architecture). A key product is IBM Cloud Private for Data, its oddly named platform for managing and governing machine learning data, which integrates data science, data engineering and application building processes into a single console and administration environment. 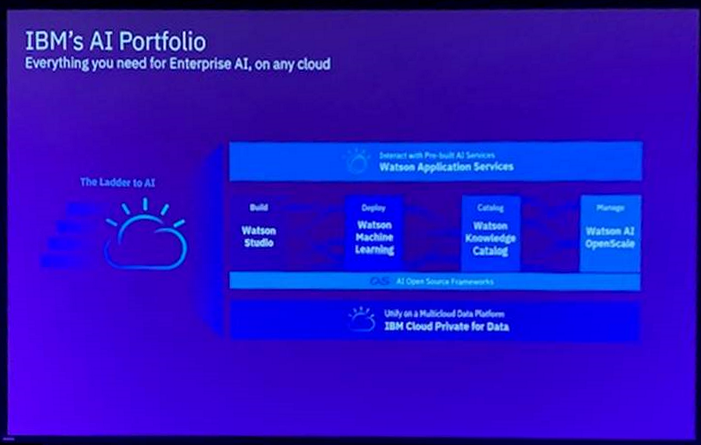 Watson Applications, a set of prebuilt applications for common uses such as in analytics, digital assistants, information discovery and business automation. IBM also offers products for specific sectors, such as healthcare, financial services and media and entertainment. Think’s biggest announcement was IBM Watson Anywhere, which adds another dimension to the company’s portfolio. In line with its corporate strategy, IBM stated that it would make Watson portable across multiple public clouds, giving businesses a consistent way to build, deploy and run AI models and applications in on-premises and public cloud environments such as Alibaba, Amazon Web Services, Google Cloud or Microsoft’s Azure. IBM has built new Watson microservices in Kubernetes containers using OpenShift, which abstracts Watson from its previous dependency on the underlying IBM cloud infrastructure. It hopes the flexibility of Watson Anywhere, based on open-source technology, will encourage more organizations to move beyond experimenting with AI by giving them more options to run AI wherever data resides and so reduce the fear of lock-in. IBM has staked out a major claim in the AI market with this move. In Ms Rometty’s words, Watson is now “the most open and scalable AI platform for businesses in the world”, which is poles apart from 18 months ago, when Watson was plagued by PR problems and a reputation for being expensive, inflexible and a black-box system. Although IBM will have to invest in integrating, configuring and optimizing Watson to work consistently with all the major public clouds, the move reinvigorates its strategy after a difficult few years. Another essential part of IBM’s strategy that came alive at Think was Watson OpenScale, its AI management and governance platform that includes the trust, monitoring, explanation and transparency tools launched in 2018 (see Trusting Watson). Born out of its research arm, the platform aims to address concerns about “black box” AI by giving customers ways to improve the visibility and control of AI systems as well as explain outcomes. It does this by monitoring the performance, health and behaviour of machine learning models at runtime. CCS Insight has long argued that companies need more instruments to help them build guardrails around AI and “X-ray” visibility into working systems. Trust in AI — or a lack of it — is emerging as the biggest barrier to machine learning adoption by enterprises. For example, in CCS Insight’s 2018 survey of IT decision-makers in the US and Europe, 43% of respondents cited trust as a hurdle to adoption in their organization. This is why IT decision-makers placed the ability to ensure data security, compliance and the transparency of how systems work among the top three requirements for their machine learning investments in 2019, according to the survey. The proper governance of AI will become crucial to establishing trust in the technology, especially as firms implement AI in their operations over the next 12 to 18 months. We believe governance spans four domains: ethical design and bias; transparency and explainability; privacy; and security, management and compliance. Watson OpenScale contains some of the first instruments in the market and is at least 12 months ahead of the competition in this important field. IBM made several other key moves worth noting. It announced a new product for business process automation, called Process Automation Intelligence with Watson. It also opened Think with a historic event that featured the first ever live and public debate between IBM’s Project Debater and human debate champion, Harish Natarajan. Project Debater is the first AI system designed to debate humans on complex topics. It stems from IBM research into natural language processing, computational argumentation and reasoning, machine listening comprehension and deep learning. Mr Natarajan won the debate according to the audience vote, but 60% felt IBM’s platform better enriched their knowledge of the subject. The event illustrated how fast AI is progressing and was another reflection of how valuable IBM’s research arm is to its business; few companies are turning AI research into products faster than IBM at present. Think showed us that IBM offers some of the most differentiated and competitive enterprise services for implementing AI in enterprise operational processes. In improving the clarity of its corporate message, the company has also added some much-needed simplification to the positioning of its AI products, which can be best seen through the image I took at the event below. A far cry from 18 months ago, IBM can now point to strong differentiators in providing open, hybrid and multicloud services, governance and applied AI for industries. It has a broad portfolio that runs from systems to services and is supported by a formidable research arm and a partnership with the Massachusetts Institute of Technology, which are feeding its factory of new AI products at an increasing rate. However, IBM’s strategy isn’t perfect, and it still has work to do in improving its marketing and messaging, especially in the areas it leads, such as trusted AI and governance. Key product names tend to confuse and don’t accentuate the value proposition enough. And despite improvements in how Watson is marketed, it remains an inconsistent brand used widely across the company. Above all, IBM will also need to improve its strategy for developers. This area received little attention at Think 2019. Red Hat’s 8 million open-source developers should be a significant boost to its partnership with Apple, as will the flexibility in its strategy with Watson Anywhere, but IBM will need to impress upon the developer community why its AI tools are the best. Overall, Think revealed several steps forward in IBM’s strategy for AI. Such improvements will be critical if IBM is to win the AI race and lead the enterprise AI market in 2019 and beyond.